Years ago, I shared an apartment in NYC with a model who divided her time between Manhattan and Ibiza, Spain. She traveled between the two frequently and always with Felicia, her beloved black pug. It was not easy, as Felicia did not like flying, but absolutely nothing could stop my roommate from taking her . 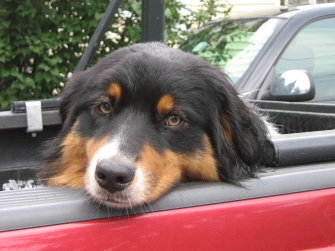 For those of us with pets, parting with them every time we go someplace really pulls at the heart strings. I know people who don’t travel because of their dogs and I know people who Skype with their dog-sitters so they can “visit” while on the road. Then there are those who do whatever they have to so they can travel with their dogs. Some plan their stays around pet-friendly hotels, others choose trips that are specifically designed to include dogs. 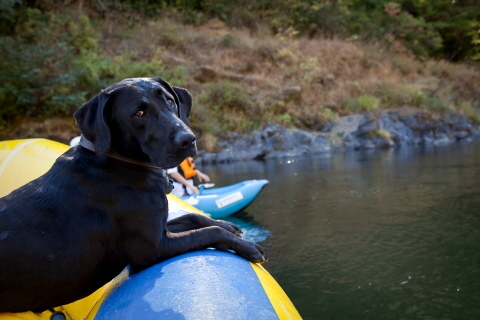 The dog on our home page and above, Sage, is enjoying a Paddle and Paws Rafting trip with Rogue Wilderness Adventures. For three days, a small group of dog owners and their dogs, raft and walk Oregon’s Rogue River Canyon, camping at night. Not a bad life. Sage is reaping the benefits of being well connected. 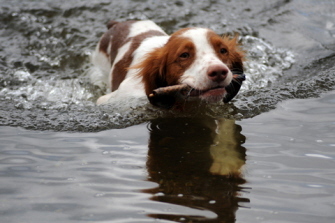 Her owners (Josh and Stephanie Kelleher) are river guides for the company. Still, the ultimate adventure dog, she does not let grass grow under her paws. She has traveled extensively, especially in the Pacific Northwest. 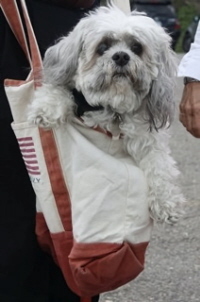 Here, we introduce you to nine other US-based dogs who are frequent travelers. They'll go anywhere and don't even need a map. 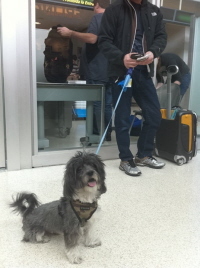 Some of these dogs are in and out of airports. Others prefer to travel by car. Some are puppies, others are getting up there in years. Some easily fit in carry-on bags, others not so. The common denominator? Their owners take them with them as often as they can. Why? Well, one owner, Jane Turner, summed it up beautifully, "It makes us all happy." Name is short for "Over Under's Bodacious Too"
Has traveled to/in: He was born in Minneapolis and as a field-trial competitor has traveled in California, Arizona, Oregon, Washington, Idaho, Nevada and Montana. Favorite destination: A ranch in northeastern Montana. 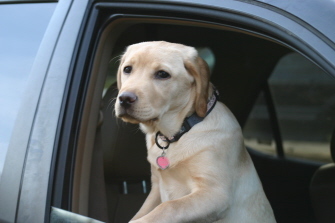 devoted to things to do and places to go with dogs in Northern California. Has traveled to/in: New York State, Vermont, Massachusetts, Washington, DC, Pennsylvania, South Carolina and places in between. Favorite destination: The Colgate University Boathouse (around the crew team) and anywhere else the truck is going. 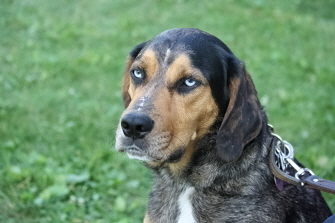 Note: Bailey is four years old and has only spent one weekend away from her owners during that time. She has never been kenneled as they prefer only to travel to dog-friendly places. In French, LouLou is a nickname for Louis. Pictured here at Newark Liberty International Airport. Favorite destination: Miami, especially walking on Lincoln Road and highly recommends dogbar in South Beach. Has traveled to/in: Throughout the northeast. Has traveled to/in: Vermont and upstate NY (Just getting started, though. She's a tad over 4 months old). Pictured here, being "smuggled" into a wine tour in the Finger Lakes region of New York State. Lots of hotels put out the “Welcome Dogs” mat these days. A very good thing as far as we're concerned. BUT for those who have canines who are not exactly designed for planes, trains or hotels, it’s good to know that you or your kids can “borrow” a pooch. 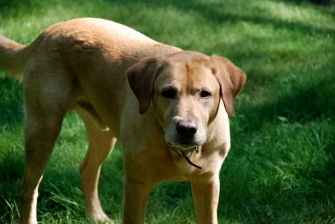 At some of the Fairmont Hotels & Resorts, there are resident dogs known as Canine Ambassadors. These sweeties make great companions for walks about town or even just for a bit of cuddling. Two of them have been catapulted into literary fame as leading characters in Catie Copley’s Great Escape, a children’s book, published by David R. Godine. Catie Copley is the resident black Labrador at the Fairmont Copley Plaza in Boston. 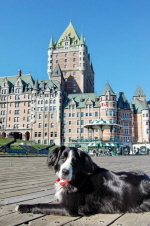 In the story, she gets to meet Santol, the Canine Ambassador at Fairmont’s Le Château Frontenac in Quebec City. (FYI...Santol--pictured above--has a Facebook page. Send him a friend request: Santol Ambassadeur Canin). The two have lots of great adventures exploring their respective cities. 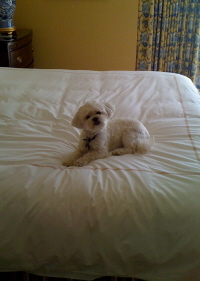 To see which of the Fairmont Hotels have Canine Ambassadors, click here. 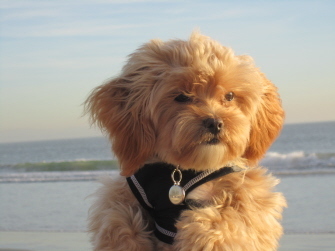 Do you have a dog that likes to travel? You can easily upload a photo and provide details (like those to the left) here.